Heba El-Cheikh is a creative producer and arts manager based in Cairo who has been working with young people and communities since 2009, initially with The Journey and now with Mahatat for Contemporary Art. We met a few years ago and I’m glad to call her a friend. We’ve talked about the challenges of doing community-oriented arts work in her country, but I’ve not yet had a chance to see the work myself. This piece, written to accompany an exhibition of art aftert the ‘Arab Spring’ that has just opened in Vienna, gives a glimpse of how young artists are reimagining community art in a changing world. The question hung in the air, with a mix of confused and aggressive facial expressions and a clueless, empty gaze that I received from the young officer on this warm winter afternoon in Port Said (a city situated along the Suez Canal in Egypt). It all started when we decided to expand our activities, thanks to a generous grant that we received from Drosos to support our program ‘Access to Art’ and its three projects: ‘Art of Transit’, ‘Mosaic’, and ‘Face to Face’. During the ‘Art of Transit’ project we began to organize a quarterly artistic and performative tour of the cities in which we operate: Greater Cairo, and three large cities in the Delta Region, namely Port Said, Damietta, and Mansoura. Our first tour, in October 2014, was intended to be as visible as possible, no longer a low profile presence in the streets (as was our previous strategy). 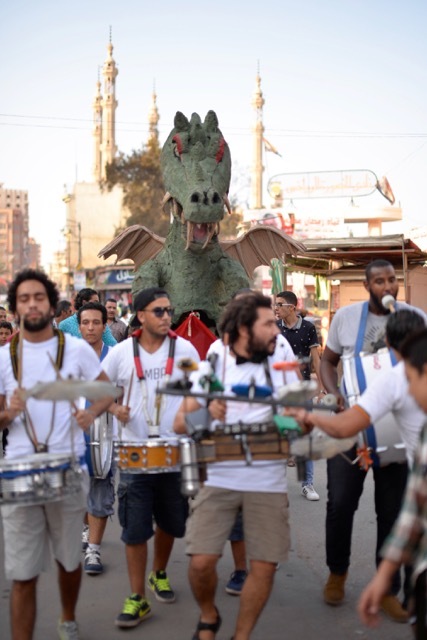 We brought together the Oscarisma marching band with the giant puppets of Al Kousha for the puppets to make a ‘spectacular’ entry into the streets of the city, bringing joy, happiness and entertainment to passers-by. Our first march in Port Said was quite successful. 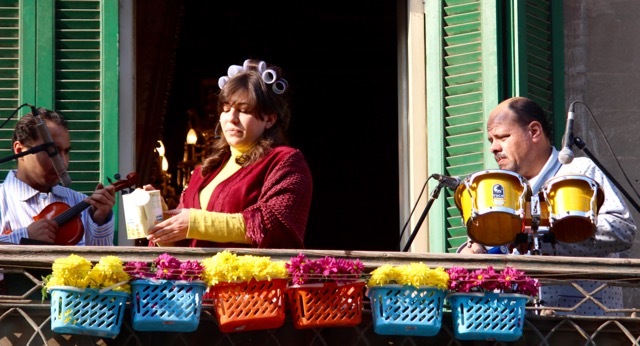 The mayor of the neighbourhood was positively surprised by the ‘quality’ of the show – so much so that he recommended we slightly shift the location of the second march, which was intended to be performed at Souk Ali, a local market on the outskirts of the city. The new location was a few blocks away from the market, in a square. Just our bad luck this was in front of a police station – a location, among other sensitive buildings such as hospitals and mosques, we would usually avoid while performing. They didn’t have to move from their place: all big security trucks, vehicles, jeeps, a dozen special forces in their black outfits and masks, officers, and soldiers of lower ranks were there surrounding us, looking at us with astonishment. Our bouncers and security men with big muscles, and our volunteers on the ground, stepped away, leaving me to deal with the security. I found myself, in my pretty blue dress, with a big smile, delicate voice, and the polite tone of a well-behaved lady, trying to explain to the young officer what we were doing. I had to repeat ‘It’s a show, a performance, you know, puppets, music … you know, old street art? Aragoz? Storytellers?’ over and over in an effort to make them understand what we were doing. I even started to point at the musicians and performers wearing their instruments and puppets in order to explain what our ‘show’ was about. Finally, I showed him, confidently and firmly, the permit that we received from the neighbourhood authorities. Luckily this was the only authority who consented to hand us a written permit. It is worth mentioning that previous to this tour, organized in October 2014, we had never opted to secure any permits to perform in the streets of Cairo, or Damietta. We were aware from the start that the ‘permission’ and ‘consent’ of our audience and the community living in the space/neighbourhood, (such as coffee shop owners, workers, and vendors), was more important than a permit from the authorities. With the new geographical expansion of our tours, we started to secure permits, as they are important in our times, (especially considering the escalation of events after June 30th 2014), to provide a safe environment for performers, crew, and audiences. Nervously, the young officer walked away, talked to his chief officer on a walkie-talkie, and then gave me the phone to talk to the chief. I repeated the whole story, again with no success: the chief also did not understand what I was talking about. Five minutes later he came down himself, read the paper carefully, and finally agreed that we could perform, (but not on the market street because ‘it’s a dangerous place full of drug dealers’). Instead, we were allowed to perform on the city’s main street, escorted by a few dozen officers and special forces. Amused, I followed the march and surprisingly overheard the same young officer talking to his wife on the phone, proudly telling her that he was now providing security for some artists playing in the street. At that moment, I realized this officer might never have attended a live show in his whole thirty years of life – no theatre, no music concerts, nothing! Rien! Nada! This officer is like any other Egyptian citizen who has little-to-no access to art because of centralization, and/or social and geographic exclusion. 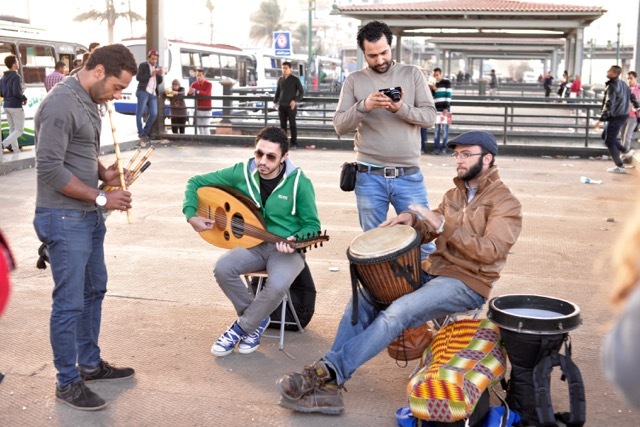 The cultural scene in Egypt is mainly divided between two kinds of organizations: state institutions affiliated with the cultural ministry, such as the opera house in Cairo and the national theatres, and the culture palaces and clubs. With the nationalist politics of Nasser in the 1960s and the 1970s, art and culture became more and more centralized, only diffused and produced in the governorates by the Ministry of Culture and its institutions. These state-sponsored institutions dominate the culture scene in the governorates outside Cairo and Alexandria. Back in early 2000, independent organizations such as TownHouse Gallery, CIC (Contemporary Image Collective), and Al Mawred Al Thaqafy (Culture Resource) appeared on the scene and, with older commercial galleries such as Mashrabia and Karim Francis Galleries, pleaded for quality in art and independence from the corrupt state system. Most of these organizations, galleries, workshop spaces, and exhibitions venues are located in Downtown Cairo. Both state-sponsored spaces and the independent art scene remain inaccessible to the majority of the Egyptian population as they are either geographically, or socially exclusive. However, there are still a few established organizations located in Cairo that have a community outreach approach, such as Artellewa, Alwan wa Awtar, and El Takeiba art spaces. 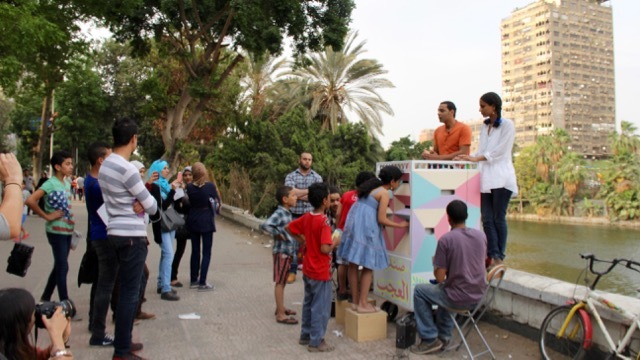 In late 2011, my partners and I founded Mahatat for contemporary art, as we aimed at making art visible in the daily life of Egyptian citizens and more accessible and decentralized from the capital by organizing art in the public space and community engaged art projects. Now we realize that by organizing artistic interventions in public spaces, not only do we offer an entertaining, fun, and reflective experience to the audience, but we also create a reference, a new collective image and memory about certain art forms that existed in the public sphere that we are restoring from neglect and dust. Although the accessibility of art was always, and since the very beginning, Mahatat’s main objective and goal, this reality struck me strongly and deeply. In March 2015, six months later, we organized a new tour in different locations in the four cities. This time we performed classical music and songs. The programme was a mix of famous opera songs and Arabic oldies, recognized and loved by the whole Egyptian audience. 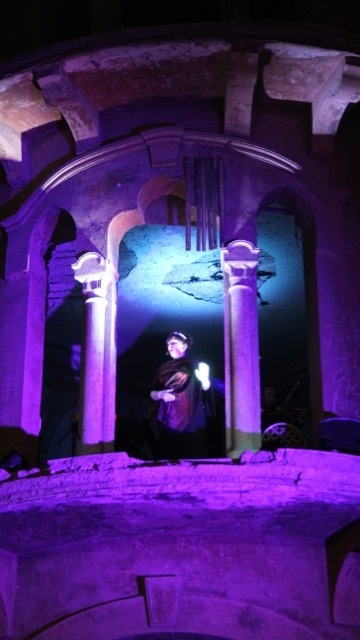 All this was performed on balconies in the respective cities and in a historical ruined palace in Mansoura city. We were there to witness the pure amazement of the audience, watching and listening to the prima donna come out onto the balcony and sing her soprano melodies, accompanied by a violinist and percussionist, all wearing pyjamas and robes. I was enchanted to see the little kids dancing, amazed watching this handsome singer in his tuxedo coming out of the balcony of the ruined Red Palace (al ahmar) in Mansoura, transformed by light and music into a magical fairy palace. We would have been very content with just the sparkles in the eyes and the enchantment of the audience, but we were also much rewarded! With the constant presence of security escorting our performances with their cars and sirens (to protect us), we were surprised as the rigid faces of the state’s security officers (amn markzy) grew softer and tenderer, song after song. They had also joined the lines of our audience. And this was a new victory for us. In the idealism and simplicity of this statement, the old man summarized the essence of why we are doing this. He might have answered all the questions, the insecurities and uncertainties we had struggled with throughout our four years of working in the streets – the questions we have been trying to find answers to. His statement has simplified all the justifications we had repeated in front of our families, friends, donors, audiences, and even politicians. We believe that art does not need to have a certain message, it is not about educating people nor cultivating them, but it is all about providing moments of pure joy, and reflection. Art restores life and is rooted in the core essence of human rights and dignity. Heba El-Cheikh is a cultural manager and freelance writer living and working in Egypt. After studies in French, translation and journalism, she gained a Masters in Arts Management at Utrecht University, with a thesis on Community Arts Evaluation Practices in Egypt (2015). In 2009, she co-founded The Journey Cultural Group in Alexandria, working with young people on creativity and critical thinking, and in 2011, Mahatat For Contemporary Art in Cairo. The ‘Aragoz’ is a traditional hand-made wooden puppet that used to wander public spaces, usually during traditional festivals, ‘Mouled’, and weddings. Aragoz stories usually criticize one or more aspects of Egyptian life and culture, represented by their reckless and satirical character.